The autumn colours, sights and sounds stir a certain longing in most cooks to bake. For many North Americans this means pumpkin pie – a dish almost synonymous with the autumnal Thanksgiving celebrations. In South Africa, we grew up eating pumpkin fritters doused with cinnamon sugar alongside our Sunday roast, so a sweet dish with pumpkin as its star is no stranger to me. In my pie recipe, however, the pumpkin (or butternut squash) shares centre stage with some gorgeous persimmons. Persimmons vary in colour from golden yellow to burnt orange and red, and can be round or oval. Persimmon trees carry either astringent fruit (whilst unripe) or non-astringent fruits. The astringent cultivars (such as Eureka, Hachiya, Saijo, Tamopan, Tanenashi, Triumph, etc. ), are high in tannins and must be allowed to ripen fully until the flesh attains a consistency akin to jelly. The non-astringent kinds (Fuyu, Gosho/Giant Fuyu/O’Gosho, Imoto, Izu, Jiro, Maekawajiro, Okugosho, Suruga, etc.) contain less tannins and can be eaten when still crispy. 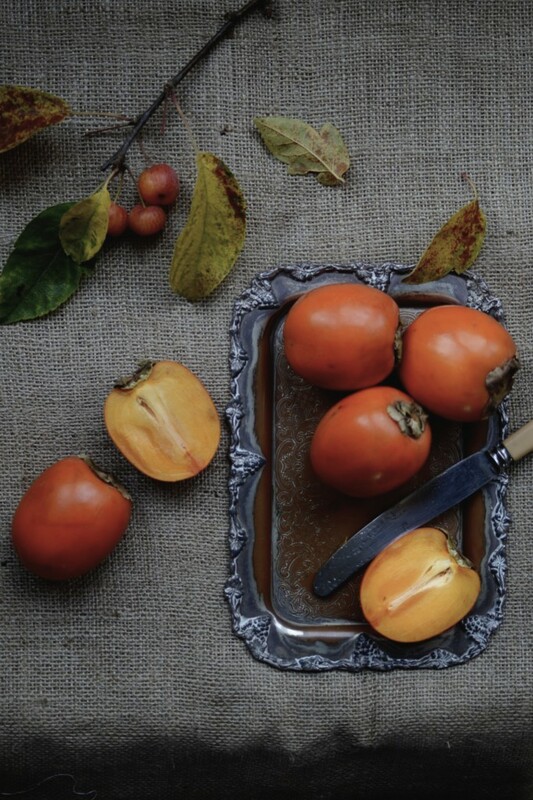 Persimmon fruit, originally from East Asia, has a sweet, succulent flesh that holds several health promoting benefits. Persimmons contain flavonoid poly-phenolic anti-oxidants such as catechins and gallocatechins in addition to an important anti-tumour compound, betulinic acid. Catechins are known to have anti-infective, anti-inflammatory and anti-hemorrhagic properties. Fresh persimmons also contain other anti-oxidant compounds like vitamin A, vitamin B, vitamin C, beta-carotene, lycopene, lutein, zea-xanthin and cryptoxanthin. Together, these compounds functions as protective scavengers against oxygen-derived free radicals and reactive oxygen species that play a role in ageing and various disease processes. Fresh persimmons also contain minerals like potassium, manganese, copper, and phosphorus. 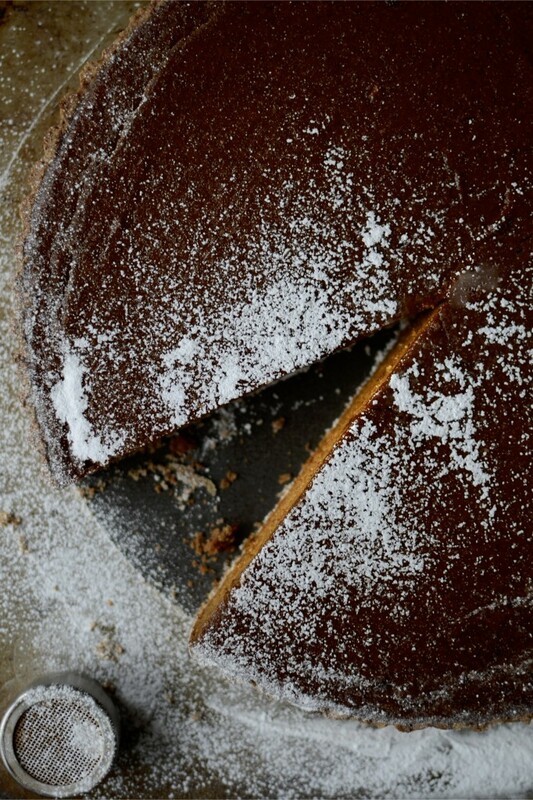 Grease a 28cm (or 11 inch) loose-bottomed tart form. For the pastry: put the flours, date sugar, salt and cold butter in the bowl of a food processor and blitz until it looks like coarse sand. This step can also be done by hand by rubbing the butter into the flour with your finger tips. With the motor running, add 1 to 2 tablespoons ice cold water or until the dough starts coming together. Or if you are doing it by hand, just keep sprinkling cold water on the dough until it starts to come together. Tip the pastry out into a bowl and knead very briefly until you have a smooth (not crumbly or sticky) ball of dough. Roll out thinly between two pieces of greaseproof paper, then fold it over your rolling pin and lay it across your greased tart form. Press the pastry into the edges and up along the sides, trimming where necessary. Refrigerate for at least half an hour. Preheat oven to 180°C / 360°F. When the pastry is completely firm, remove from fridge and place on a baking sheet. Partially blind bake in the hot oven for 10 minutes. To make the filling: in a food processor, puree the roasted squash, persimmon flesh, date and brown sugars, and spices until very smooth. Scrape the filling into a little pot and, stirring continuously, cook over medium heat until the mixture starts to bubble (about 5 – 7 minutes). Set aside. Whisk together the milk, cream and eggs, then whisk the pumpkin mixture into the egg mixture. Carefully pour the filling into the pastry shell and bake for 30 minutes or until filling is lightly cracked around edges and still a tiny bit wobbly in the centre. Allow to cool completely before slicing. Serve with Greek yoghurt, soured cream or crème fraîche.